I've been thoroughly yelled at because I didn't mention Minh's (One of the guys out at the pond) 10.39 pound trout he caught yesterday. He caught others too. So, here you are Buddy. This is what 10.39 pounds of Mt. 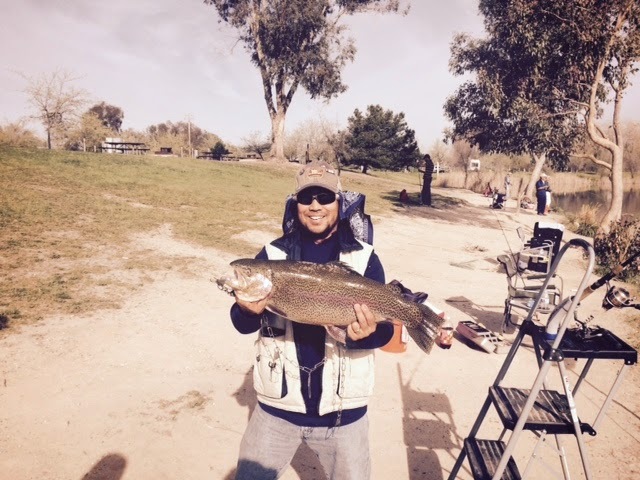 Lassen Rainbow Trout looks like. Bill Trussell asked what Mouse Tails looked like. Here is what they are. They come in 10 colors and you fish them like a rubber worm (for all you Bass fishermen out there). You can also put them on a slip sinker rig and just let them float around until the trout find them,. You can find them at most places. I got mine at Walmart, Big 5, and Cabela's. Hi Bill. I just got an email from him and he caught another 10+ pounder and a 15+ pounder yesterday. He tends to sight fish. I've always said the pond had BIG fish. He (or he and his family) eat them. I've heard that they is a little heavy for the fly rod, but a Power Worm and a small split shot work well. I've caught trout stripping an orange Power Worm. Mark, don't feel bad. I have been fishing all my life and have never caught a 10lb trout. Congrats to your buddy. Hey Alan. See what I told Bill and take into account that he started trout fishing on December 18, 2014. The fish of a lifetime right there! Wow, that's an impressive trout, and definitely worth a share!